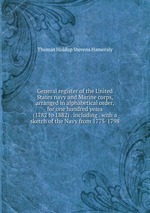 Аннотация к книге "General register of the United States navy and Marine corps, arranged in alphabetical order, for one hundred years (1782 to 1882) . including . with a sketch of the Navy from 1775-1798"